Drop A Box – It’s that easy. What size is a Drop A Box? 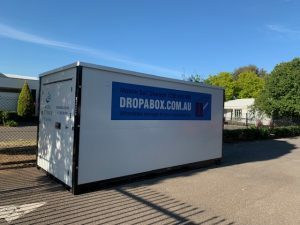 Our Drop A Box is sized at 4.8m long x 2.4m wide x 2.4m high which is generally big enough to store all the goods from a small 3 bedroom house. Total portable storage containers space is 11.52 sqm or 27.65 m3. Our portable storage box is a convenient size to move furniture into or for business storage. Where can I put my Drop A Box? Generally speaking we can place your Drop A Box anywhere that there is access. Many councils allow you to put it on the nature strip but you would need to check with your local council and obtain appropriate permission. You could also use a car park in front of your home. Otherwise we can place it on your driveway or yard and to some degree we can manoeuvre it to your chosen location such as outside your back door. Can I buy packing materials? Yes, as part of your checkout process you have the option to buy a variety of packing materials and moving boxes that will be delivered with your Drop A Box. Alternatively you can buy online or in store from ABLE Self Storage. We sell cardboard boxes for moving. They come flat pack and you tape the top and bottom. We stock T Chest, Book cartons, Wine boxes, picture boxes, Bubble wrap, tape and plastic covers for moving furniture. 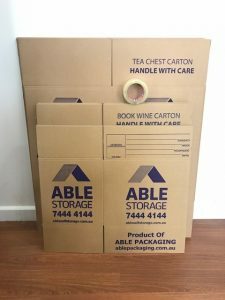 How long can I have a Drop A Box mobile storage? You can have the Drop A Box for as long as you like. We have a minimum charge of one week but you may actually have the Drop A Box on your premises for as little as 1 day if you choose. Delivery and Pick up charges remain the same. Once your order is confirmed we will email you some paperwork to sign and return to our office before delivery (scanned and emailed copy or in person). There are fundamentally two expense types that are incurred when you use Drop A Box. Delivery and pickup of the box and the daily hire costs. Delivery is costed out based on your location but starts at $70, and the daily hire rate varies depending on how long you have the box (more than a month is cheaper). Your exact price is calculated in the checkout process – no surprises! Delivery is confirmed by phone to you after booking as we need to confirm truck availability for your mobile storage. You will be charged a pick up / delivery if you are not ready and we send a truck. If you want the mobile storage unit picked up from your original address and taken to your new address there is also a cost for this. When booking your Drop a Box you have the option to pay for the entire time you have a Drop A Box (pay 6 months and receive a 5% discount) or you can select to pay monthly. For storage pods rates fill out the form or email us. That’s easy to answer! Drop A Boxes are completely weather proof. Simply choose to pay for 6 months or more and qualify for a 5% discount. Can Drop A Box help me load my Mobile Storage Unit? Yes. We have removalist available to load your Dropabox if you need us to. This is and extra cost so please contact us DropABox and we can assist you. What are some of the advantages of Drop A Box? Load the Drop A Box at your leisure. You can keep your Drop A Box for as long as you need. You can free up a spare room for a short or long term period while still being able to access your goods conveniently. Renovating? Use Drop A Box mobile self storage for a safe way to store your valuable assets whilst your house is a little less secure. Store building materials onsite in our portable storage box. No double handling of your goods while you move house. Is the booking date firm? When you make a booking on this site we will phone to confirm our delivery date and approx arrival time as we schedule trucks for this. We reserve the right to have to change the delivery date or refund you if we are unable to meet your time frame. We will, however, do our very best to fit in with your plans. We bring a portable on demand self storage unit to your property, you load it with your goods and then either keep it on your property or have us pick up the full container and store it at a storage facility with Able Self Storage. Either way we take the full or empty unit away at the date you request. (Subject to our confirmation) It really is that easy, Mobile Self Storage – Its just that! Affordable storage at your convenience. What happens if I need the Drop A Box for longer than I booked? If you need to keep Drop A Box longer than booked we will do our best to make this happen for you, stock permitting your needs will be met. Simply phone us on 1300 580 808 and discuss your situation. 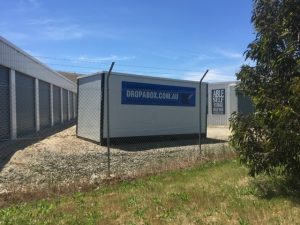 When booking your Drop a Box , check the storage pods rates, you have the option to pay for the entire time you have a Drop A Box (pay 6 months and receive a 5% discount) or you can select to pay monthly. 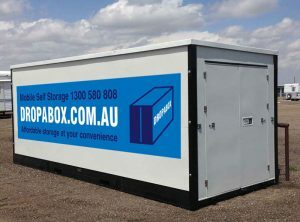 The mobile storage unit is charged from when it is delivered to your site. When the delivery charge is created you also prepay for the pickup of the pod. We don’t mind at all if you wish to use Drop A Box for business purposes! Have your stock delivered directly to a Drop A Box – free up valuable realestate. Do you have seasonal stock? – use Drop A Box for storage only when you need it. 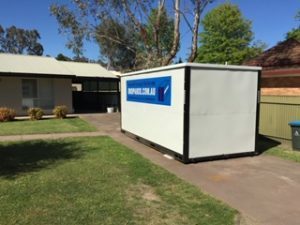 Make use of “just in time storage” with mobile self storage Adelaide. Drop A Boxes are weather proof so ideal for those documents that need to be kept safe storage on site. To find my closest self storage it can be in your yard. it looks like we can’t service your area at the moment. We are always expanding, please phone us on 1300 580 808 or check again later to see if we’ve got you covered. Where do you want to store your box?